A Liberal's Libretto: The State of the Union - why this time must be different. The State of the Union - why this time must be different. "He shall from time to time..." Well, tonight's the night. 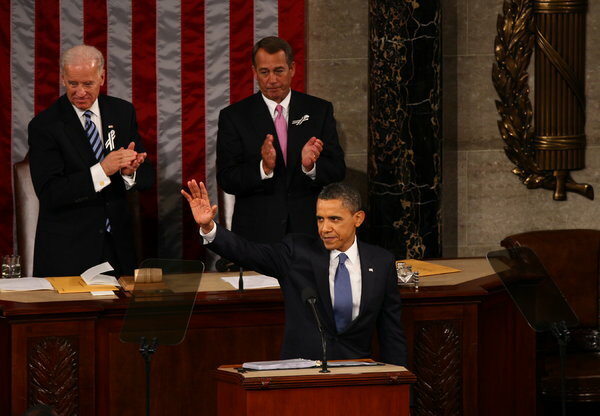 President Obama gives the first State of the Union speech of his second term. Given what has transpired over the last few months, I am absolutely on pins and needles with anticipation about what he will say. And more importantly, how he says it. It is evident that the Obama Administration has been beating the drum for gun safety legislation ever since the Newtown massacre happened on December 14th. And, they're smart to continue to beat that drum. In the past, we Americans hear about a shooting in a movie theater, or a place of worship - we even watch in horror as one of our public servants is nearly assassinated - and, we shout our disdain and pound our fists in outright anger over the massive gun violence sweeping across our country only to let that furor and rancor die out. Days turn into weeks, weeks turn into months and we move on. Then, when another gun related tragedy strikes, we simply lather, rinse and repeat. Veronique Pozner wanted Malloy to see what the bullets did to Noah, who was barely 6, the youngest Newtown victim. In the casket, Noah's eyes were closed, his long lashes resting on his cheeks, Naomi Zeveloff reported in the Forward. The bottom half of his face was covered by a cloth. "... there was no mouth left," Veronique Pozner told the newspaper. "His jaw was blown away." In Noah's right hand she placed a clear stone with a white angel inside. She wanted to place one in his left hand, too, but that hand was gone. Noah was shot 11 times. Here's the bottom line for me: Protecting life is protecting life. It's not a game of pick and choose ... advocating for the protection of life in one instance and letting it slide in another. Yes, the Obama Administration sees that it must continued to keep gun safety on the front burner, and so do most Americans. This time must be different. We need to continue to beat the drum for gun safety legislation. REAL gun safety legislation. So, that being said ... what should we look for in tonight's State of the Union? Politico says there are 5 things to watch for - and, one of them has to do with the subject at hand. How far does [Obama] go on guns? The big question is not whether Obama will mention his gun push but which part of it he will emphasize — and how much the issue will dominate the night. There has been little support beyond Obama and Vice President Joe Biden for a proposed assault weapons ban, and virtually all of the White House’s gun efforts have been focused on universal background checks — which has yet to receive much support from Republicans in the House or Senate. Gun control is part of a responsibility to protect the nation’s children, Obama says, and on Tuesday he’ll call for congressional action, boasting of bipartisan agreements in place on background checks and new anti-trafficking laws. Obama will travel later in the week to his hometown of Chicago, which has seen a recent spike in gun violence. But on Tuesday night, he’ll look out at many victims of gun violence and their family members — the administration and its gun control allies are bringing 120 of them to the White House on Tuesday for a briefing and dozens of members of Congress gave their single guest ticket to the victims of gun violence and their families to watch from the gallery. Former Rep. Gabrielle Giffords (D-Ariz.) and her husband, Mark Kelly, will be in the audience. The parents of Hadiya Pendleton, the 15-year-old Chicago girl shot and killed weeks after performing at Obama’s Inauguration, will sit with first lady Michelle Obama. So, let's watch tonight. Then, we'll actively move forward because this time must be different. It just has to be. For the protection of innocent lives. As a side note: after the State of the Union tonight, be on the look out for a new ad. The ad comes from Americans for Responsible Solutions, the organization founded by former Rep. Gabby Giffords (D-AZ) and her husband, retired astronaut Mark Kelly. At a six-figure buy, the ad will air on the major cable news networks (and, Fox News too). It will also air in Washington, DC and in the cities represented by congressional leaders: San Francisco (Nancy Pelosi); Cincinnati, OH (John Boehner); Louisville, KY (Mitch McConnell); and Las Vegas, NV (Harry Reid).